Now with over 60 franchises up and running, Snip-its is revolutionizing the haircare industry with its a branded entertainment concept focused on the specific haircare needs of children. The children's segment of the haircare industry, a $45 billion market, is currently estimated at $5 billion, with over 40 million children in the United States receiving a haircut an average of eight times per year. The hair care industry is estimated at $45 billion, with the children's sector of the market estimated at $5 billion and growing… literally. Business owners looking for a recession-resistant business with strong, consistent reoccurring revenue streams should look no further. By the way…a Snip-its business also operates during normal business hours, carries very little inventory, no receivables, and absolutely no spoilage! 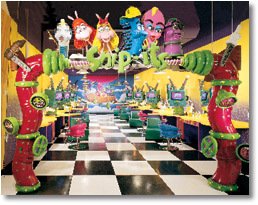 Snip-its is the only concept that can boast proprietary cartoon characters, custom computer play stations, a Magic Box, and branded hair care products. 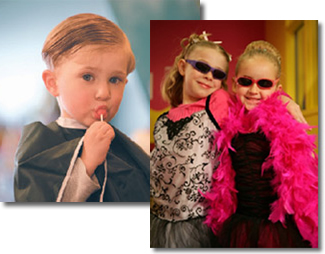 All of these unique elements, along with custom training programs for franchisees and their staffs, combine for a perfect hair care solution for kids, parents…and franchisees, too. 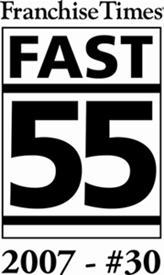 The only child focused salon to make the list. The Snip-its Franchisee Support System has been designed with one goal in mind—to make it as easy as possible for franchisees to open and operate a successful and rewarding business. The Snip-its team is excited to help its franchisees in all aspects of their business—from real estate to store development to marketing and ongoing operations. Royalty fees are 5% the first year and 6% thereafter. Marketing fund contributions are 1.5% the first year and 2% thereafter. "Snip-its brand may be new to the Twin Cities, but we are quickly becoming a household name. We love having a child-focused business and are excited to grow with Snip-its." "Snip-its has a great support system, with experienced and knowledgeable field reps along with the tools we need to build our business." "We own three salons and are opening more. Snip-its has given us the ability to control our careers." If you are a passionate, creative, and qualified entrepreneur, and you like what you've read so far, we invite you to take the next step by completing the email form below for additional information. Snip-its' business systems are built on three legs of success: first, to "deliver magic" to all of our customers; second, to offer strong profit potential for franchisees; and third, to maintain a financially strong parent company. We believe that teamwork is the key to success – all in support of these common objectives. 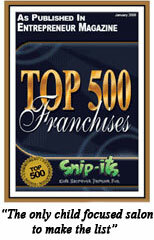 Click on Request Information for FREE info on how to open a Snip-its Hair Cuts For Kids franchise today! Please Note: This Snip-its Hair Cuts For Kids franchise opportunity and other franchise business opportunities, businesses and franchises for sale on this web site are not to be considered as an "offering", "franchise offering", suggestion or recommendation by Franchise Leader™. This advertisement depends entirely on the truthfulness of the information provided by our advertisers which includes, but is not limited to, franchisers, franchise brokers, franchise consultants and business brokers. Franchise Leader™ recommends that you consult a lawyer, financial consultant, accountant or professional advisor before buying a franchise or business opportunity or any type of business. By using this form or any part of our website, you have agreed to all terms and conditions of Franchise Leader™. Please review our Terms & Conditions for more information.